When you hear the name Schuller, what do you think of? Kitchens, right? 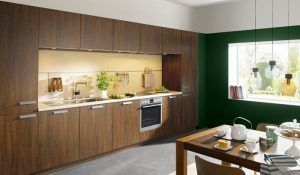 Well you wouldn’t be alone, as Schuller are one of the most recognizable German kitchen brands. Despite being one of the largest brands in the world, this organization remains a family run business, which is committed to delivering extraordinary quality and impeccable customer service. Founded in 1966 by Otto Schuller, the first built in kitchens were planned and produced between 1971-1975 and the company grew a work force of around 75 employees. By 1984 they were manufacturing 15 different ranges with 60 different fronts and 5 carcass designs. Their workforce continued to grow and by 1984 they had 200 employees. This innovative company continuously led the way with kitchen designs, and recent figures say that they now employee around 1662 people and manufacture more than 130,000 kitchens a year locally in Germany, providing countries all over Europe with quality kitchens. Each kitchen is individually tailored to the customers specifications and made under environmentally sound practices. Let’s take a look at some of the ways they are doing their bit in protecting the environment. Awarded the PEFC logo in recognition of their commitment to the environment and the economic use of wood as an indispensable raw material. The concept of PEFC is to work to preserve the natural forests and their ecological balance. Working with wood means there is a lot of waste, but Schuller take their waste wood and generate the heating energy for the whole company in a thermally clean manner. Schuller cover thousands of miles as they supply kitchens all over Europe, therefore to be environmentally responsible, they have been investing in eco friendly and fuel saving trucks. Kitchens need a lot of packaging, so Schuller enlisted the help of a recycling management company to ensure that all packaging materials are environmentally friendly and recyclable. Here at Kitchen Finesse we offer a wide range from the Schuller Kitchens, and would encourage you to come into our showroom to have a look around and take some brochures home to help you decide which kitchen best suits your needs. Schuller have up to date technology, clever storage solutions and finishes to suit every taste out there.